Portugal’s Ton-Up Garage has a knack of building practical, stylish customs that work beautifully as daily riders. 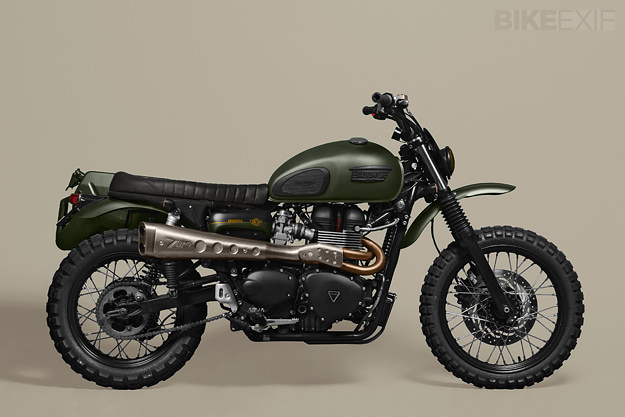 Their latest build is this 2012 Triumph Scrambler, nicknamed ‘Amazonia’ and commissioned by a client who loves off-roading. 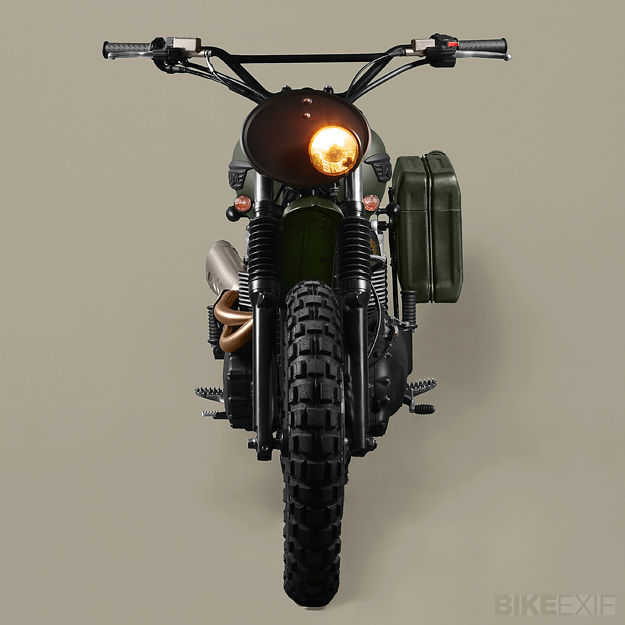 “The brief was to build a bike with off-road aesthetics,” says Pedro Oliveira, “such as the tires, foot pegs, bars and so on—but with good on-road handling, because it’ll be used on the road every day.” So the team started with an airbox elimination kit to increase power, and installed a Zard Short exhaust—a design that fits both the injected and carbureted versions of the Triumph Scrambler. The rear mudguard was shortened and the front mudguard was lifted slightly. The seat is a custom fabricated two-up design and the old-school off-road bars have been fitted with Magura levers. 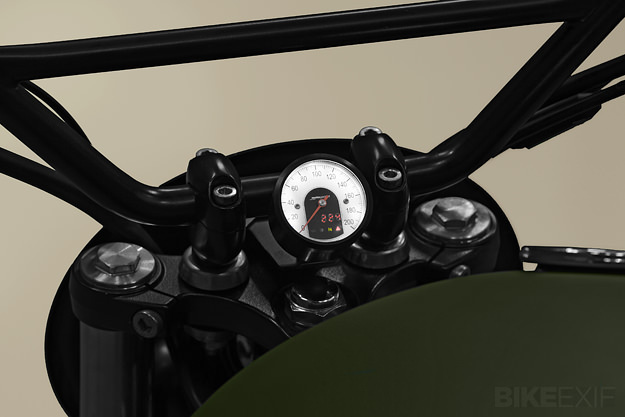 Other components are minimalist in design, from the Lucas-style taillight to the small indicators and the Motogadget ‘Tiny’ speedo. The stock rear shocks have been swapped out for Öhlins units, and the fork springs are now Öhlins progressive springs. The finishing touch was a respray in deep green and an old jerry can converted into a luggage box. 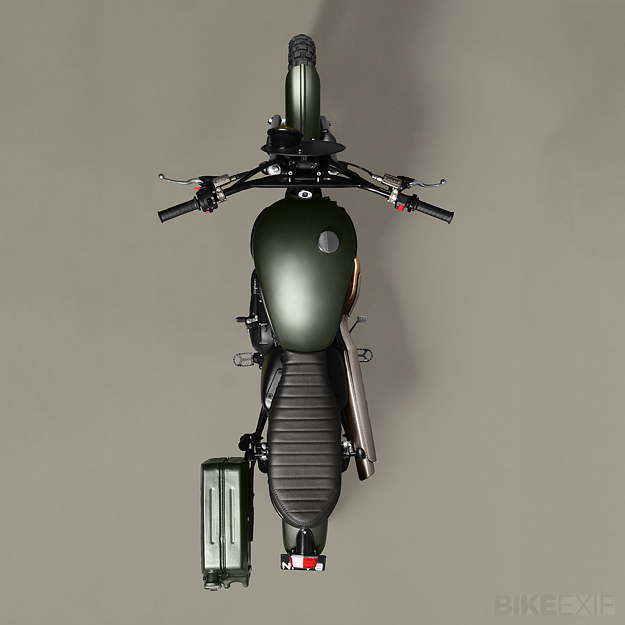 The result is a Triumph Scrambler with a useful boost in dynamics—with more power, better handling, and the ability to tackle forest roads with ease. And it looks pretty good too, don’t you think? Images by Joel Bessa. 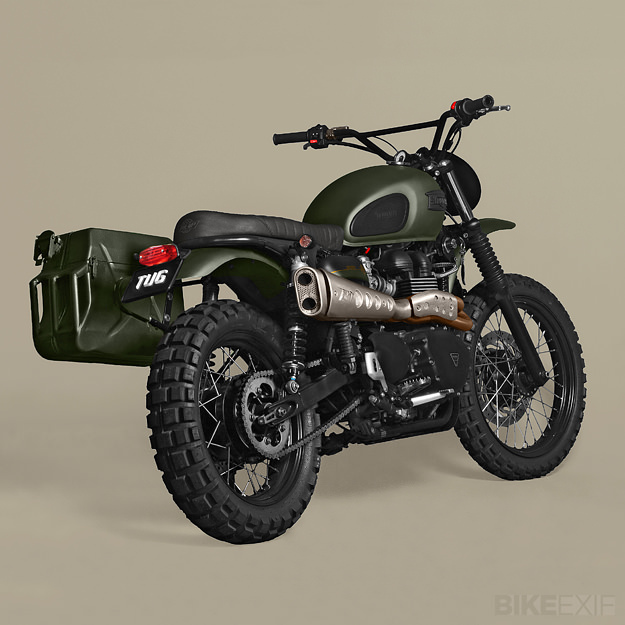 Head over to the Ton-Up Garage website to get their latest news, or check our coverage of previous Ton-Up builds here.